It feels like magic when you connect with someone who is in the same energetic space as you are. It lights you up even more by increasing the open flow of energy. But there are also those times when we connect with the energy vampires of the world. Or maybe we ARE one of them? That is a tough realization. I have been on both sides of this equation. 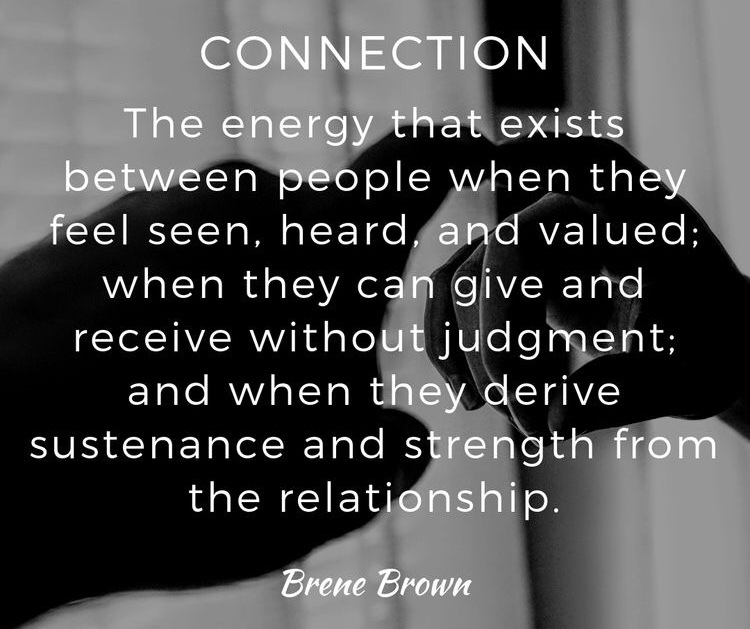 I really love this definition of connection from Brene Brown. There were times in my life when I believed I was connected to the people I spent time with. Was I gaining strength from being with a group of women who believed that alcohol was a necessary part of “surviving” motherhood? Was I deriving sustenance by gossiping and complaining? Passing judgement, feeling insecure, comparing wounds? Trying to out-do the misery of the other person? Maybe I was feeling seen and heard to a certain extent, but valued? That was a hard no. I think when we’re in pain internally, we seek out others with the same wounds in an attempt to relate and find some solace in our circumstances. It’s like we feel justified in our inner chaos if we know that we aren’t the only one who feels that way. But the bad feelings stick around in those situations. It’s like the negative energy cyclone just swallows us up! Day in and day out, each person feeding into the pain and unhealed wounds of another. So how do you escape this cycle and find real connection? For me, started with a decision. This is not fulfilling me at any level and I need to change it immediately. Taking that hard look within and realizing that I was responsible for my own life and happiness. I may not have caused all of the wounds that I had, but I was certainly responsible for healing them. I decided that I was no longer satisfied with the surface relationships in my life. Once I was doing the inner work to heal my wounds, I was able to see and feel my own authenticity. Naturally, those unhealthy situations that I had mistaken for connection began to fall away. It was a baby step process for me. I’m not going to tell you that magically I had all these deep, connected relationships in my life. I certainly did not. I spent a lot of time being alone and getting to know myself. I am a firm believer that to connect with another person on a deep level, you must first be connected to yourself. I also needed to connect to my Higher Power. That was a huge part of my journey to self-acceptance as well. Living my life from a place of total honesty was the birthplace of my vulnerability. I began to seek out the company of other like-minded individuals. It actually began as an intention. I let the Universe know that I was done living with a victim mindset and finding solace in sharing misery with others. I was ready to step out of that shallow place. Many amazing humans began to show up in my life. But along side them were many more who offered me the opportunity to fall back into the space of drama and turmoil. Each time that I chose to stay in my integrity and purpose, the challenging situations lessened. I hold strong boundaries with my personal time. I know who I am and what I stand for and that is something that I won’t ever compromise again. I do have a huge reserve of love, compassion and empathy and I am willing to share that with those who need it as long as I do not suffer in the process. The cool part about connection is that we get to define what that means to us on an individual basis. You get to make the rules for your life! We live in a time where virtual connection is often mistaken for true human connection. We may feel validated by our “likes” on social media and the number of followers we have. Social media is certainly a great way to find your people, but there is something to be said for spending time in real life with other individuals that you can relate to. You can start to find people based on what you love. You love to knit? Go to a knitting workshop. You want to do yoga? There are yoga studios everywhere. Get the Meetup App and find a group to join! I love books and wanted to join a book club, but all the clubs near me included wine. Alcohol is not my jam so I started my own: OC Sober Girls Book Club. We meet and eat treats and drink coffee and talk about books and it’s great! There are so many ways to connect with others these days. Workshops, Conferences, Meet ups, Clubs, Conventions. Try them until you find out what feels best for you. If you’re testing the waters, join a Facebook group to start. There are thousands of groups out there! Try them out and if they make you feel like crap then leave. You get to decide what works for you! It’s ok to be nervous when you’re trying to connect with others. Trust me, I totally get that. It was waaaaaay outside my comfort zone to step out by myself and try new things. But the more I do it, the more confident I feel. Also, we are not for everyone. Not everyone will like you (and vice verse) and that is OK! I’m a huge sucker for some authentic human connection. Take a chance and find what works for you.